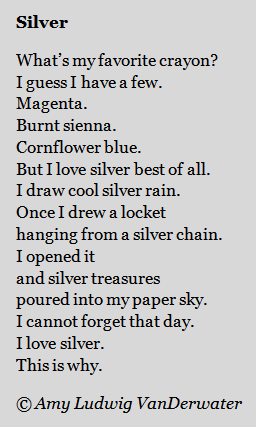 During April 2012, I wrote a poem for each letter of the alphabet. How did I find the ideas for these poems? 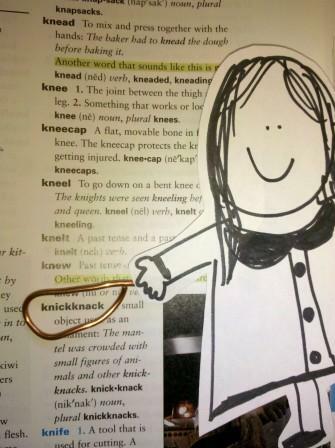 Why, in the dictionary, of course! 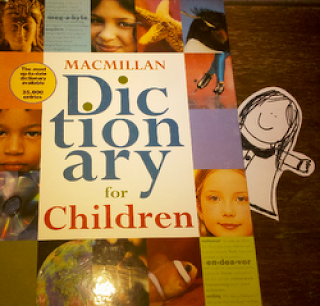 Below you can see me as a paper doll, sticking out of my children's dictionary. Each day, I closed my eyes and opened my dictionary to a new letter, checking beforehand where that day's letter began and ended in the book. I began with A and worked my way to Z. Once the dictionary was open to a page, I would swirl my finger around around, and then I'd let it land. Finger on a word, I opened my eyes to see which word I had landed on. And then, each day, I wrote a poem using the word under my finger! 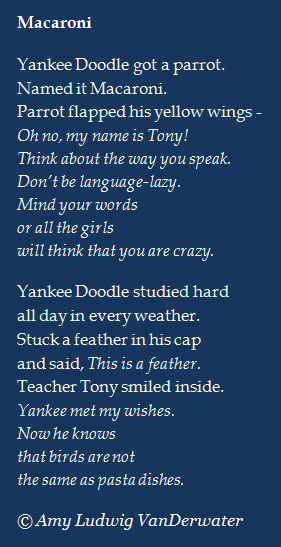 This project was inspired by "The Lanyard" by Billy Collins as well as the 2012 March Madness poetry tournament over at Ed DeCaria's Think Kid, Think! 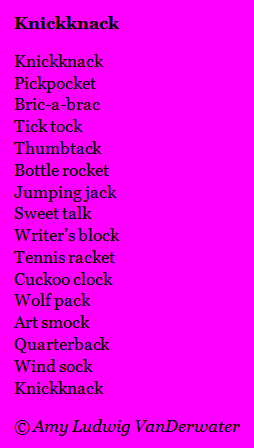 It was also inspired by something we teachers often say in writing workshops, "Just pick a word and go!" When you scroll through all 26 poems below, you will be reading a month's worth of work. If you are interested in knowing more about any one of them (how I got the idea, something about the form, an idea for you to try), just click on the magenta heading and you will be sent directly to that day's post. 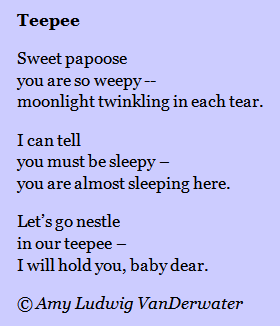 Under each poem, you will also find a recording of me reading the poem to you. I am hoping that this will feel like one of those museums or zoos where people get to learn and listen with headphones! 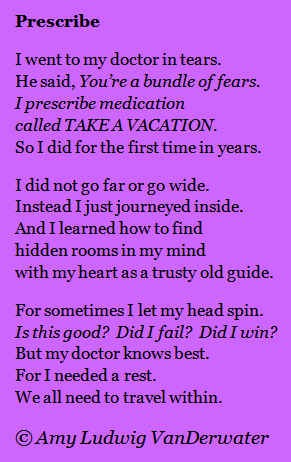 At the end of March, I had no idea what I would do here for National Poetry Month. One day in March, I was blogging along and just typed in the idea that I'd do a Dictionary Hike. It was a very spontaneous thought, and I could not have guessed how much I would have learned or enjoyed this journey. 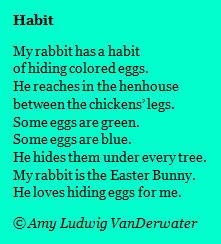 It's been wonderful to read the poems and comments from haiku-friend Lisa Vihos and several others, and I tried some new forms and wrote about words I never would have chosen on my own. The Dictionary Hike taught me that if we want to, we can write from anything. The whole world is inspiring. Here's the Hike in its entirety, except for D & F, which are currently under consideration for a new collection. 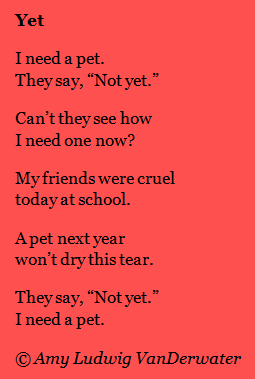 Click the title above each poem to learn more about it. 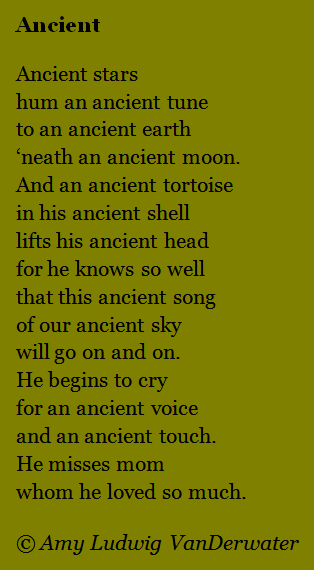 Click the arrow below each poem to listen to the poem. Click below for an audio introduction to the Hike. And that, my friends, was the Dictionary Hike. 26 poems on all kinds of topics. Now I will sit and drink a glass of water, thinking about all that I read and learned this month. I will be back next Monday for regular postings. In the meantime, today I am visiting two different places! 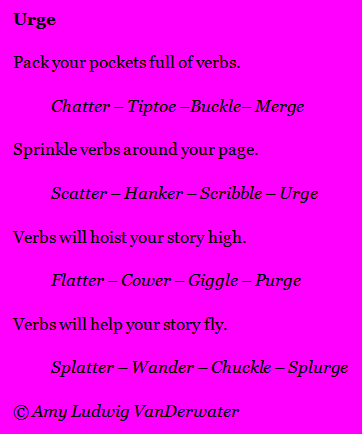 I am very happy to be spending the day at Author Amok with Laura Shovan as a part of her series of 30 Habits of Highly Effective Poets sharing a bit about my revision process. Author Amok is one of my "poetry haunts," and you can visit Laura there regularly to find poetry, writing advice, teaching ideas, and more. Thank you, Laura, for having me over to visit! Today I will be happily visiting Wonderopolis as well! Today's WONDER is What is a Poetry Slam? and I have written the Try it Out! section. If you do not know Wonderopolis, this site asks and answers a different questions - from any area - every day, and then answers it in all kinds of ways. It's perfect for home and classroom too, feeding the curious. Allan Wolf - The drawing for Allan's ZANE'S TRACE will take place on Monday evening. Our final notebook-sharer of April 2012 at Sharing Our Notebooks is Heidi Mordhorst. She takes us through her notebooks and tells us about double-drafting-by-hand. She has also offered a very generous giveaway of a specially modified version of her beautiful book PUMPKIN BUTTERFLY to a reader. Today is the first chalking celebration over at Teaching Young Writers, and Betsy welcomes us to come and see who is chalking which poems today. If you have a moment, a road, and some chalk...consider chalking a poem yourself! Here is my offering, an old favorite. 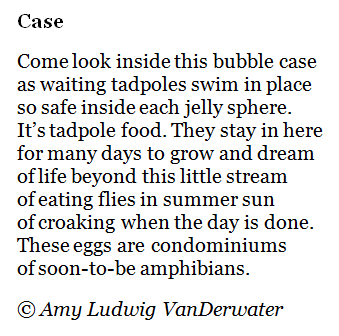 Wow, Amy, this would make a wonderful little book, with lots of backstories, too. Congratulations on the accomplishment, & doing the audio as well. I loved your chalk poem sharing. Well, Amy! That is quite a collection of wonderful poems. I am so glad we went on the journey together...me, following along a step or so behind. I look forward to more fun adventures with you in the days to come. Amy, I am inspired. Next year I plan to go from the SOL Challenge to your Dictionary Hike. I love that you put it all together with the links and the audio. What a great showcase! What a wonderful collection! I do hope to join you next year. And how beautiful is that chalk poem idea? Why don't we do these things more often? So glad I finally "discovered" you, new friend! What an incredible accomplishment! You have packaged it beautifully too! And what a fun surprise to find you on wonderopolis! Keep at it, Amy....it is so inspiring to watch where your words take you! 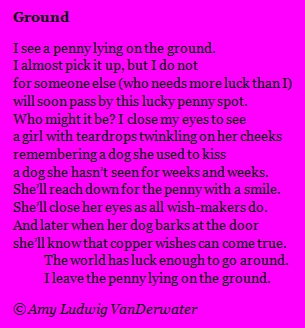 I am sharing your poems from A-Z with my students today as we get a moment here and there. I just love that they can hear your voice! Love the chalk too, what a great choice. 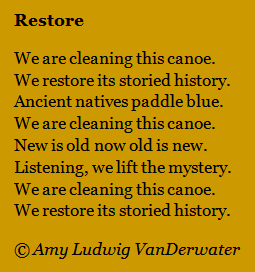 Amy, I just read and listened to your poem hike. I loved the ability to hear you read. Later, I'll read the comments. I love "Bluegrass" with all the colors and the farmer's love for his cows and "Case" and the pairing of condominiums with amphibians. And I definitely think "Zenophobia" should be the actual dictionary definition of the word! Three cheers for your accomplishment. 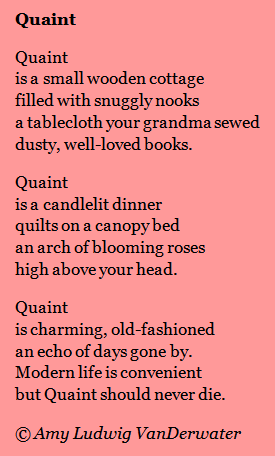 This collection is such a gift to poetry lovers young and old. We have enjoyed the Dictionary Hike and will surely revisit to listen to you reading them. Wonderopolis - WOW! How exciting to have your great ideas featured there. This is a site that we visit often. 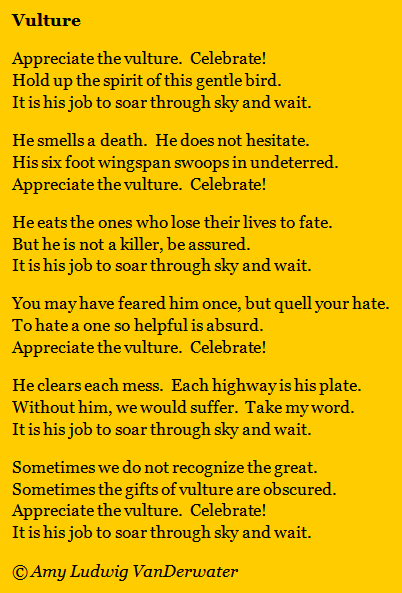 Congratulations on a very productive Poetry Month. 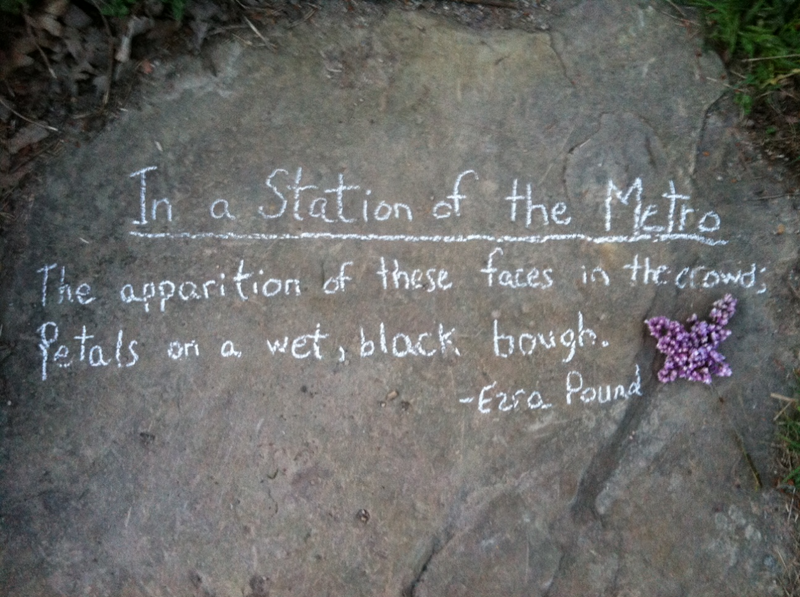 I loved the way you wrote "In a Station of the Metro" Simplicity of chalk on rock is fitting for one of my favorite poems. Are those lilacs looking like a butterfly. Perfect! Thank you very much, everybody, for all of your kind comments. 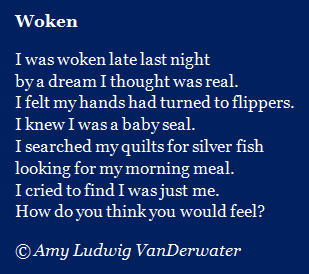 When I was taping those poems in the middle of the night, I was hoping they would be useful...and it is so good to hear that they'll be heard by children. Please let me know if your students record their own poems and if you'd ever like to have me publish them here. I use SoundCloud as it is free and easy to figure out. I am taking a few days off, so see you next Monday! Thank you for this amazing collection (I think we'll have Poetry Friday this week on the computers at The Poem Farm!). Thank you for the inspiration. I'm thinking about my own private dictionary hike challenge. Maybe in...July. I second all of the above. I hope you get a host of new IRA readersl lots of teachers were at my session and I told them great things about the Poem Farm and your Dictionary Hike. Thanks, too, for explaining about SoundCloud. I am looking for something to use to record for my students, but since I don't yet have a blog, I have to find a way for them to access!! 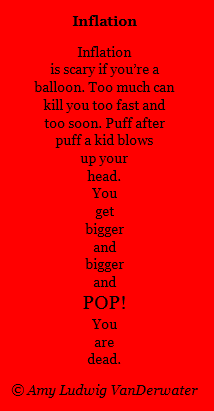 A to Z Poetry! Amazing! AmyZing! How very cool...I loved the way you meandered from topic to topic, letting your imagination and your poetic resourcefulness take you from poem to poem. Linda is right, this would make a wonderful book. These are fabulous. 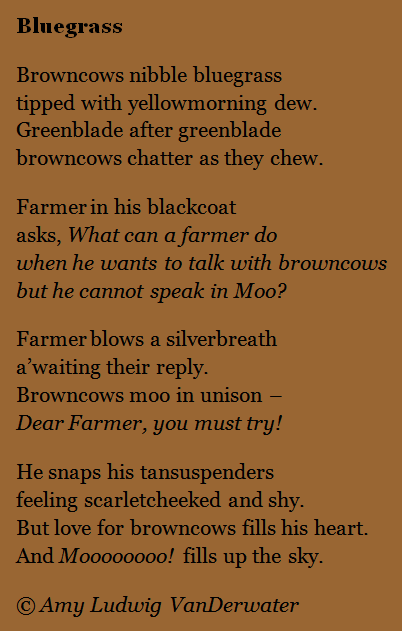 I especially love Blue Grass with those Browncows.